Want to learn more about the mortgage process, before you jump in? You're in the right place. This tutorial explains how to apply for a home loan in step-by-step fashion. Below, you'll learn how to apply for a mortgage loan the right way. I've refined this list of steps over the years, to account for the common mistakes first-time buyers make. This list is designed to prevent problems before they arise. Here are the ten steps I recommend when you applying for a home loan. Check your credit reports and scores. Choose the right type of loan. Find a lender and shop for rates. Find your house and make an offer. Give your lender the purchase agreement (for appraisal). Wait for the underwriting process. We will discuss each of steps in more detail below. If you'd rather move forward with the process right now, you can use the link provided at the top of this page. It's an easy way to apply for a mortgage online, through the LendingTree website. The mortgage application process varies from one borrower to the next. So your experience may be different from the one described below. With that being said, most home buyers will go through all of the steps below. Or at least they should. You should know what your credit score is, before you apply for a mortgage loan. Why? Because it's one of the key pieces of information the lender will use when reviewing your application. They will use your FICO score to determine (A) if you're qualified for a home loan and (B) what kind of interest rate you can get. If your score is too low, you might not get approved at all. So it's something you want to know before you apply for the home loan. Terminology note: FICO (pronounced fie-coh) stands for Fair Isaac Corporation. This company is named after cofounders Bill Fair and Earl Isaac. Among other things, FICO is known for its credit-scoring system. This formula considers the information in your credit reports and assigns you a three-digit number based on that data. This number is referred to as your FICO credit score. Mortgage lenders use this number as an indicator of risk. It shows them how you have borrowed and repaid money in the past. A higher score will improve your chances of getting approved for a loan. It will also help you secure a lower interest rate. A lower score has the opposite effect. As you apply for a mortgage, you will hear the lender talk about your credit score a lot. In fact, it's one of the top-three factors that will determine whether or not you get approved for a loan (your debt and income round out the list). This is why you need to know where you stand. Applying for a loan without knowing your score is like playing poker with your cards facing the wrong way. The other person knows more about your hand than you do. As you can see from the image above, your credit score is based on your financial activity. The length of your credit history ... your history of making payments ... any late payments or debt collections you've had ... all of these things are used to determine your FICO score. So when you apply for a mortgage loan, your financial history will come back to help you -- or haunt you. The diagram also shows why you need to check your credit reports, in addition to your scores. They are related, but they are still two separate things. For instance, let's say you order your scores alone. You find out that you have a 550 FICO score. This is a low score, and it's going to hurt your chances of getting approved for a home loan. So naturally, you would want to know why it's so low. The only way to find out is by looking at your credit reports. This is where the negative entries will show up (late payments, bankruptcy filings, legal judgments, etc.). You can request all three of your reports through AnnualCreditReport.com. Why should you use this website? Because it's the only one regulated by the federal government. This website is jointly owned by all three of the credit-reporting agencies -- TransUnion, Experian and Equiafax. They are required to offer your reports through the site, and you are entitled to receive one free credit report per year (from all three agencies). You can get your scores through MyFICO.com. You'll pay a small fee for them -- they're not free like the credit reports are. But you need to know this information. It helps you negotiate with the lender. The last time I ordered my scores through the FICO website, I paid around $15 for each one (TransUnion and Equifax). You can no longer get your Experian score through MyFICO.com. I think the two companies had a falling out. But two out of the three scores is enough to know where you stand. Summary: You need to review your credit situation before you apply for a mortgage loan. The lender uses your FICO score when deciding whether or not to approve your loan application. They also use it to assign an interest rate to your loan. You can get all three of your credit reports for free by using AnnualCreditReport.com. You can get your scores through MyFICO.com for a small fee. This article explains how to apply for a mortgage. Applying for the loan is actually quite simple. You just fill out the application and provide whatever documents the lender requests. But you also want to apply for the right kind of mortgage loan -- the type of loan that meets your needs now and well into the future. Conventional mortgage loan are offered by lenders in the private sector, with no government backing of any kind. Government-backed loans are also made by lenders in the private sector, but they are insured by some agency of the federal government. The government insures the lender against losses from the borrower defaulting. FHA loans and VA loans are two popular examples. A lot of first-time home buyers use the FHA loan, because it allows you to make a smaller down payment. It's also easier to get approved for a FHA loan. But you'll pay a premium for these benefits, in the form of mortgage insurance. If you use a conventional loan with a down payment of 20 percent, you can avoid paying mortgage insurance. You also need to figure out if you want to apply for a fixed-rate mortgage, or one with an adjustable rate of interest. Here again, there are certain pros and cons to each option. The fixed-rate mortgage (FRM) carries the same interest rate for the entire life of the loan. So your payments will stay the same as well, even if the loan has a 30-year term. The adjustable-rate mortgage (ARM) has an interest rate that changes over time. In the case of a hybrid ARM loan, the rate will remain fixed for the first few years. Then it will start adjusting after that. You might enjoy a lower rate during the fixed period. But you'll also face the uncertainty of a fluctuating rate that could increase your monthly payment. How do you apply for the right type of mortgage loan? You do this by thinking about your long-term plans. If you know for certain you'll be selling the home a few years down the road, you might want to consider the ARM loan. If you think you'll be in the home for a long time, the fixed-rate loan is your safest option. Summary: This article explains how to apply for a mortgage loan in step-by-step fashion. But it's equally important to choose the right type of loan. Your two biggest choices will be (A) conventional versus government-backed mortgages, and (B) fixed versus adjustable-rate loans. Think about your long-term plans, and choose the loan that best supports your situation. Use the links provided above to learn more about the pros and cons. This concludes part one of our tutorial, How to Apply for a Home Loan. In the next section of this tutorial, we will talk about the documents you will need when applying for a mortgage. You'll also learn how to shop for a lender and get pre-approved for a loan. Applying for a mortgage loan is a paper-intensive process. You will sign dozens, possibly hundreds, of documents and disclosures before it's all through. You'll also have to provide certain documents relating to your financial background. 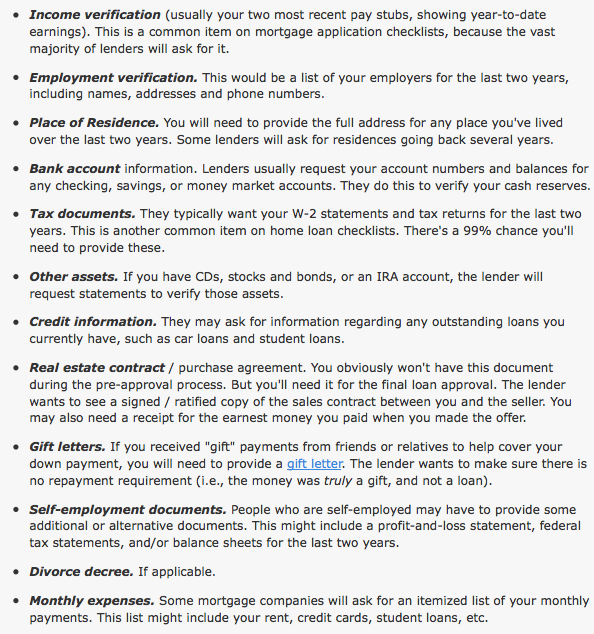 The lender will start asking for these items soon after you submit your application. If you start gathering them now, the process will move more quickly later on. I recommend that start a mortgage file or folder to keep your documents together. Note: Make sure you give your lender photocopies or faxes of the original. Do not give away your original documents when you apply for the loan. Keep the originals in the mortgage file I suggested earlier. The lender will need the original versions of any of their documents you've signed, such as the application form. But you should keep the original version of your documents (tax returns, bank statements, etc.). Of course, there are exceptions to every rule. But this is generally how it works. Before you apply for a mortgage loan, you should be familiar with the average interest rates being offered by lenders. This is the only way to know if the lender is offering you a good rate. Are they offering the average rate? Is it better than average? Or is it below average? Obviously, this is something you want to know. Mortgage rates fluctuate constantly, like a rollercoaster with no end. Following the weekly trends will suffice. You can find this information online. Freddie Mac publishes a weekly survey of the primary mortgage market. This survey shows you the average rates for the most popular loan categories -- 30-year fixed, 15-year fixed, 5-year ARM and the 1-year ARM. You'll also notice that the rates usually descend from highest to lowest across those categories, and in that particular order. The 30-year fixed mortgage usually has the highest rate, because it gives you the most predictability over time. You'll pay a premium for that stable rate. The 1-year ARM loan usually has the lowest rate, but with the highest risk for borrowers. When we were buying a home in San Diego, we narrowed it down to three different lenders. One was the builder's preferred lender, Bank of America. We were surprised to find that BofA offered us the best rate. They also required a lot less money in cash reserves, which helped a lot. But this was the third lender we applied with. If we had chosen the first or second one, we would have paid more interest and faced a higher requirement for cash reserves. You'll find out about the lender's requirements in step #6 below, when you get pre-approved for a mortgage. Steps 5 and 6 overlap a bit. You can get pre-approved by several lenders at once. Rate shopping doesn't hurt your credit the way some people think. So don't be afraid to apply for a loan through multiple lenders. If you're buying an existing home, you could use any number of lenders. Are you a member of a credit union? Ask them about their current mortgage options. The same goes for any local banks you have a relationship with. What interest rate are they willing to give you? How much of a down payment will you need? How much do they estimate your closing costs to be? Do they require you to have cash reserves in the bank? If so, how much? These are the main points of comparison when you apply for a mortgage loan. If you're going to use a specialized loan program, such as FHA or VA, you'll have to find a lender who is authorized to make those loans. You can find a list of FHA-approved mortgage lenders on the HUD.gov website. I've written a comprehensive article that explains the pre-approval process in detail. So I'm not going to repeat it all here. Here's the nutshell version. You can apply for a mortgage by getting pre-approved first. I strongly recommend this strategy. This is when the lender reviews your financial situation to determine how much of a loan they're willing to lend you. In most cases, this is the first time you actually fill out the mortgage application. You'll get two useful items from this process. The first is a number, and the second is a document. You'll learn your maximum loan amount, which helps you shop within your budget. You'll also get a pre-approval letter, which helps you when making an offer on a house. The sellers will take your offer seriously if you've been pre-approved already. Let's recap some of step we've covered thus far. You've decided which type of mortgage loan you want to use. You've been pre-approved by a lender. Now you know how much of a loan you can get. So you're ready to start house hunting! Remember, you can't get your final loan approval until you've found a home and made an offer. So the house-hunting process technically falls within the scope of our How to Apply for a Mortgage tutorial. Once you find a home that (A) meets your basic needs and (B) falls within your budget, you're ready to make an offer. This might involve some negotiating on your part. When the seller finally accepts your offer, you can proceed with step #8 below. In order to approve the loan, the lender will need a copy of the purchase agreement. They want to know how much you've agreed to pay for the house. Why is this so important to the lender? Because they need to ensure the house is worth the amount you've agreed to pay for it. Just because you apply for a mortgage and get a pre-approval doesn't mean you'll get a final approval. The lender needs to evaluate the house as well as the borrower. And this is where the home appraisal comes into the picture. If the home is valued at an amount equal to or higher than the amount you've offered, the loan will move forward. If the home appraises for less than the purchase price, you've encountered an obstacle. At this point, your loan application will be handed off to the underwriter for a closer review. Mortgage lenders use the underwriting process to further verify your credentials as a borrower. Basically, they're trying to determine if the risk associated with giving you a loan falls within their guidelines and parameters. The underwriter uses the three C's to measure this risk -- credit, capacity and collateral. Does your credit history show a pattern of responsible credit usage? Do you have the financial capacity to repay the loan, based on your current income and debts? Does your down payment meet the lender's collateral requirements? If the underwriter gives you a green light in all of these areas, there is a high likelihood you will be approved for the loan. It's a good thing too. At this point, the last thing you want to do is apply for another mortgage loan with another lender. That can be exhausting. That's why home buyers tend to hold their breath during the underwriting process. The lender might request additional documents from you at this point, too. You might have to jump through more hoops, as well. The last time I applied for a loan, the underwriter came back and said our debt-to-income ratios were too high. They weren't a problem during the pre-approval process, but they raised a red flag with the underwriter. So we had to pay off one of our credit cards to get the final approval. Be prepared for surprises during the underwriting process. Congratulations! You are now approved for you loan. The lender will now disburse funds on closing day, through the escrow agent. You are now a homeowner.